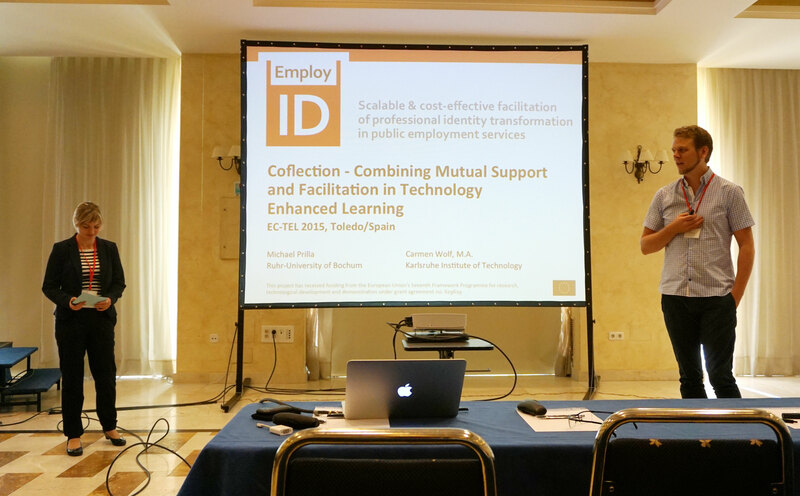 The theoretical concept of coflection was presented for the first time to an external audience at this years EC-TEL Conference in Toledo, Spain. Michael Prilla (RUB) and Carmen Wolf (KIT) first gave a short introduction why this approach is timely according to nowadays workplace learning needs. After this, coaching and reflection were explained separate and main connection as well as differences shown. The coflection concept has three levels: process level, element level and meta-level. These were illustrated and afterwards first prototypes for collaborative reflection (within a EmployID community of practice) and peer coaching revealed. The last minutes of the presentation was about how to interlink the prototypes. For more on this check out the slides or the paper. Questions were raised about how coflection will be implemented in practice and if peer coaching or coflection provide lower outcome in comparison to individual coaching with a professional coach. For implementation, the EmployID team is currently working on several possibilities how to recombine collaborative reflection and peer coaching on level 2 (element level) and how to realize this by exchange of shared data between the current EmployID prototypes of the Community of Practice (CoP) and the peer coaching room. This is all done in close collaboration with the full-partner PES within the consortium. Peer Coaching and Coflection are both methods that have its advantages and disadvantages. In EmployID main objective is to have sustainable and cost-effective solutions which made it clear that solutions where a professional coach needs to be hired are not part of the EmployID tasks. Plus the facilitation aspect is supported though both peer coaching and coflection which is one of the learning goals of the PES. The offers provided by EmployID are additional supportive elements that do not intent and will not replace formats like coaching, supervision and mentoring.